Adrian Coleman, G Train at 4th and 9th Street. BROOKLYN, NY.- The Brooklyn Museum has selected five Brooklyn artists whose work is being featured in GO: a community-curated open studio project. The exhibition opened on December 1, 2012, at the Museums Target First Saturday evening of free art and entertainment, and will be on view through February 24, 2013. The artists selected are Adrian Coleman, Oliver Jeffers, Naomi Safran-Hon, Gabrielle Watson, and Yeon Ji Yoo. The five Brooklyn artists were selected following studio visits by Brooklyn Museum curators Sharon Matt Atkins, Managing Curator of Exhibitions, and Eugenie Tsai, John and Barbara Vogelstein Curator of Contemporary Art, from a short list of ten artists. These ten artists were nominated following a Brooklyn Museumsponsored September open studio weekend during which, despite torrential rains and two tornados on the first day, some 18,000 visitors made more than 147,000 visits to 1,708 artist studios in 44 Brooklyn neighborhoods, resulting in 9,457 nominations.  Adrian Coleman, who lives in Prospect Heights and works in Fort Greene, was trained as an architect, which has informed his choice of medium and subject matter. Born in England in 1984, Coleman began using watercolor in his architectural renderings, a technique common to the drafting process. He later translated this professional experience to subjects inspired by the industrial landscape of New York City. 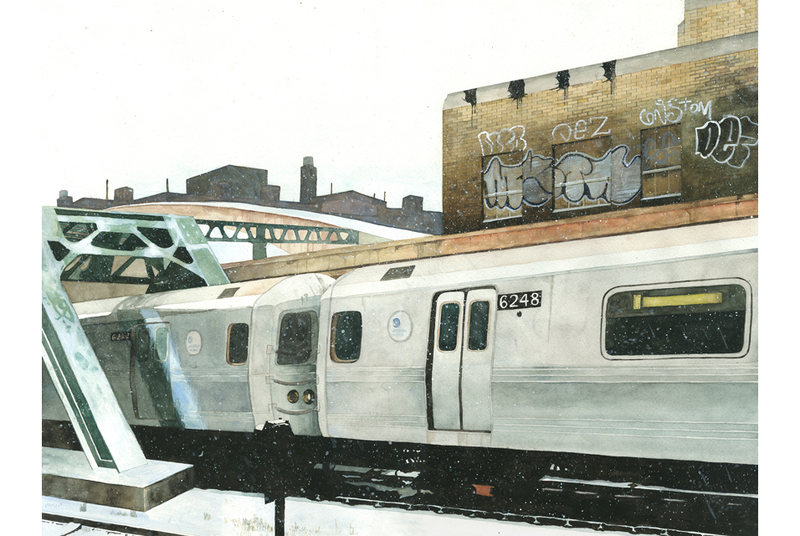 His work includes images of graffiti-covered buildings of the Gowanus, the iconic Kentile Floors sign, and a subway interior, complete with passengers.  Oliver Jeffers, who lives in Columbia Heights and works in Boerum Hill, is a painter and childrens book illustrator. Born in Australia in 1977 of Irish parents, his work explores memory and the passage of time through enigmatic narratives in a style that suggests bygone eras. In Before My Time, he uses a childhood photograph of himself as a point of departure. In Without a Doubt, Part 2, a complete portrait of a female subject was dipped in turquoise paint, obscuring the subjects features, while revealing traces under the turquoise veil.  Naomi Safran-Hon, who lives and works in Prospect Heights, is an Israeli born in England in 1984. She has photographed the damaged and abandoned buildings of Haifa, Israel, where she grew up, transforming the images with cement and lace in works that vary from the abstract to the specific. In her pieces, the lace is penetrated by the cement, setting up a tension between the tactile surface of the work and the illusion of depth.  Yeon Ji Yoo, an American born in South Korea in 1978, lives in Greenpoint and works in Red Hook. She creates installations and drawings that connect her memories of the South Korean farmland of her childhood and her training in environmental science. Her work explores the ideas of decay, loss, and regeneration. Her use of paper as both a support and a material from which she constructs large-scale installations creates a dialogue between her drawing and collage. The Andy Warhol Museum announces photography exhibition, "Jeremy Kost: Friends with Benefits"